Staff from Lloyd Dowson Chartered Accountants took part in a charity cycle ride last week ahead of the Tour de Yorkshire. 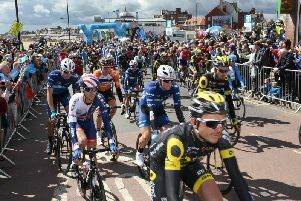 The ride, which started from the company’s Scarborough office on Falsgrave Road, finished at The Spa in Bridlington and saw the cyclists travel 22 miles. The route took the team through surrounding villages and a variety of terrain. Team members wore T-shirts specially designed for the event in the Tour De Yorkshire colours. Saint Catherine’s fund-raising manager Carolyn Jackson thanked Lloyd Dowson for their support. “We are so grateful to Lloyd Dowson and their staff who work so hard to fundraise for the hospice,” she said. The amount raised is still being counted but the total will be over £1,400.